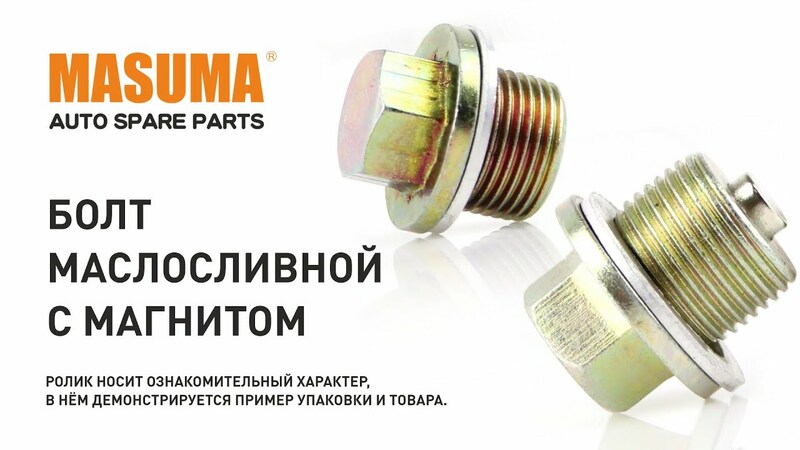 Болт (пробка) маслосливной Masuma M14x1.5, M-50. Купить оптом в Волгоградской области | Masuma - запчасти для иномарок оптом от производителя. JB419WD-2. 1900cc. 5D. F9Q. Turbo. Диз. 4WD. 2007.01-... F9Q. JB419WD-2. 1900cc. 5D. F9Q. Turbo. Диз. 4WD. JB419WD-3. 1900cc. 5D. F9QB. Turbo. Диз. 4WD. 2008.01-... F9QB. JB419WD-3. 1900cc. 5D. F9QB. Turbo. Диз. 4WD. JB419WD-4. 1900cc. 5D. F9QB. Turbo. Диз. 4WD. 2009.01-... F9QB. JB419WD-4. 1900cc. 5D. F9QB. Turbo. Диз. 4WD. JB419WD-5. 1900cc. 5D. F9QB. Turbo. Диз. 4WD. 2010.01-... F9QB. JB419WD-5. 1900cc. 5D. F9QB. Turbo. Диз. 4WD. JB419WD-6. 1900cc. 5D. F9QС. Turbo. Диз. 4WD. 2011.01-... F9QС. JB419WD-6. 1900cc. 5D. F9QС. Turbo. Диз. 4WD. JB419WD. 1900cc. 5D. F9Q. Turbo. Диз. 4WD. 2005.01-... F9Q. JB419WD. 1900cc. 5D. F9Q. Turbo. Диз. 4WD. JB419XD-4. 1900cc. 3D. F9QB. Turbo. Диз. 4WD. 2009.01-... F9QB. JB419XD-4. 1900cc. 3D. F9QB. Turbo. Диз. 4WD. JB419XD-5. 1900cc. 3D. F9QB. Turbo. Диз. 4WD. 2010.01-... F9QB. JB419XD-5. 1900cc. 3D. F9QB. Turbo. Диз. 4WD. JB419XD-6. 1900cc. 3D. F9QС. Turbo. Диз. 4WD. 2011.01-... F9QС. JB419XD-6. 1900cc. 3D. F9QС. Turbo. Диз. 4WD. JB424W-4. 2400cc. 5D. J24B. 4WD. 2009.01-... J24B. JB424W-4. 2400cc. 5D. J24B. 4WD. JB424W-4. 2400cc. 5D. J24B. 4WD. Rus. 2008.07-2016.07 J24B. JB424W-4. 2400cc. 5D. J24B. 4WD. Rus. JB424W-5. 2400cc. 5D. J24B. 4WD. 2010.01-... J24B. JB424W-5. 2400cc. 5D. J24B. 4WD. JB424W-5. 2400cc. 5D. J24B. 4WD. Rus. 2010.01-2016.07 J24B. JB424W-5. 2400cc. 5D. J24B. 4WD. Rus. JB424W-6. 2400cc. 5D. J24B. 4WD. 2011.01-... J24B. JB424W-6. 2400cc. 5D. J24B. 4WD. JB424W-6. 2400cc. 5D. J24B. 4WD. Rus. 2011.01-2016.07 J24B. JB424W-6. 2400cc. 5D. J24B. 4WD. Rus. JB632W-4. 3200cc. 5D. N32A. 4WD. 2009.01-... N32A. JB632W-4. 3200cc. 5D. N32A. 4WD. JB632W-4. 3200cc. 5D. N32A. 4WD. Rus. 2008.07-2016.07 N32A. JB632W-4. 3200cc. 5D. N32A. 4WD. Rus. RW420-2. 2000cc. 5D. J20B. 4WD. Rus. 2010.01-2016.03 J20B. RW420-2. 2000cc. 5D. J20B. 4WD. Rus. RW420-2. 2000cc. 5D. J20B. Rus. 2010.01-2016.03 J20B. RW420-2. 2000cc. 5D. J20B. Rus. RW420-2. 2000cc. J20B. 4WD. 2010.01-... J20B. RW420-2. 2000cc. J20B. 4WD. RW420-2. 2000cc. J20B. 4WD. Rus. 2010.01-2016.03 J20B. RW420-2. 2000cc. J20B. 4WD. Rus. RW420-2. 2000cc. J20B. Rus. 2010.01-2016.03 J20B. RW420-2. 2000cc. J20B. Rus. RW420-3. 2000cc. 5D. J20B. 4WD. 2010.01-... J20B. RW420-3. 2000cc. 5D. J20B. 4WD. RW420-3. 2000cc. 5D. J20B. 4WD. Rus. 2010.01-2016.03 J20B. RW420-3. 2000cc. 5D. J20B. 4WD. Rus. RW420-3. 2000cc. 5D. J20B. Rus. 2010.01-2016.03 J20B. RW420-3. 2000cc. 5D. J20B. Rus. RW420-3. 2000cc. J20B. 4WD. Rus. 2010.01-2016.03 J20B. RW420-3. 2000cc. J20B. 4WD. Rus. RW420-3. 2000cc. J20B. Rus. 2010.01-2016.03 J20B. RW420-3. 2000cc. J20B. Rus. RW420-4. 2000cc. 5D. J20B. 4WD. 2010.01-... J20B. RW420-4. 2000cc. 5D. J20B. 4WD. RW420-4. 2000cc. 5D. J20B. 4WD. Rus. 2010.01-2016.03 J20B. RW420-4. 2000cc. 5D. J20B. 4WD. Rus. RW420-4. 2000cc. 5D. J20B. Rus. 2010.01-2016.03 J20B. RW420-4. 2000cc. 5D. J20B. Rus. RW420-4. 2000cc. J20B. 4WD. 2010.01-... J20B. RW420-4. 2000cc. J20B. 4WD. RW420-4. 2000cc. J20B. 4WD. Rus. 2010.01-2016.03 J20B. RW420-4. 2000cc. J20B. 4WD. Rus. RW420-4. 2000cc. J20B. Rus. 2010.01-2016.03 J20B. RW420-4. 2000cc. J20B. Rus. RW420. 2000cc. 5D. J20B. 4WD. Rus. 2010.01-2016.03 J20B. RW420. 2000cc. 5D. J20B. 4WD. Rus. RW420. 2000cc. 5D. J20B. Rus. 2010.01-2016.03 J20B. RW420. 2000cc. 5D. J20B. Rus. RW420. 2000cc. J20B. 4WD. 2010.01-... J20B. RW420. 2000cc. J20B. 4WD. RW420. 2000cc. J20B. 4WD. Rus. 2010.01-2016.03 J20B. RW420. 2000cc. J20B. 4WD. Rus. RW420. 2000cc. J20B. Rus. 2010.01-2016.03 J20B. RW420. 2000cc. J20B. Rus. RW420D-3. 1900cc. 5D. D19AA. Turbo. Диз. 4WD. Rus. 2006.01-2016.03 D19AA. RW420D-3. 1900cc. 5D. D19AA. Turbo. Диз. 4WD. Rus. RW420D-3. 1900cc. 5D. D19AA. Turbo. Диз. Rus. 2006.01-2016.03 D19AA. RW420D-3. 1900cc. 5D. D19AA. Turbo. Диз. Rus. RW420D-3. 2000cc. 5D. D20AA. Turbo. Диз. 2006.01-... D20AA. RW420D-3. 2000cc. 5D. D20AA. Turbo. Диз. RW420D-3. 2000cc. 5D. D20AA. Turbo. Диз. 4WD. 2006.01-... D20AA. RW420D-3. 2000cc. 5D. D20AA. Turbo. Диз. 4WD.